There is obvious chaos that is routine in any ER, even at night on a Sunday. One thing I can do, tongue in cheek, is recommend, if you want to off yourself, don't use a nail gun. I've seen it twice now. People trying to, unfortunately, end their lives by using a nail gun to the head. Maybe it's actually a cry for help because people have a suspicion a nail gun doesn't have the umph to finish the job. What you'll be left with is a 2-3 inch nail sticking out of your skull, some blood, and you blinking away in disbelief. Oh yea, PS, it will hurt when we use a pair of pliers to pull out the nail. I've been tempted to pry out using a hammer, but you know, win some and lose some. How's Your Nursing BS Meter? One of the gifts of the nurse is an exceptional BS meter. Now, this skill must be honed, and some have a natural disposition to sniff out BS, but as a nurse it's an important tool when it comes to diagnosis. What tips do you have to sniff out BS? How do you tell if patients aren't telling the truth about their ailments or pains? What tactics do you use to get most of the 'real' story? 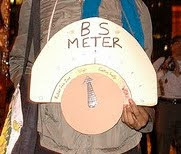 Does anybody have a cool story about how your BS meter went through the roof and you ended up saving everyone time, money, and perhaps lives? Better yet, any times when you called BS but were wrong?! Don't suspect many will want to admit to this one. Have you say, just please, no BS :P.
Curious for bloggers, really sad for Anna Brown. In case you're need context here is the report of the patient who came to a hospital, was discharged, x3, arrested, and found dead on the floor of a jail cell. Report. And some reaction thru the blogosphere: Sad outcome, proper treatment. Limited press for sad case.Labelling patients. Your thoughts? Could the doctors have done something different?